Winter Damage Of The Furry Kind . . . Cold winter winds, alternating extreme temperatures, ice and snow can be damaging to trees and shrubs. However, this spring, we are seeing additional damage due to the harsh winter conditions that is of the furry kind: rabbits and rodents. Mice and rabbits often damage young trees in the winter by feeding on the juicy, green cambium layer just under the bark and girdling the tree. Damage from these furry creatures occurs most commonly in winters when there is prolonged, heavy snow cover and food is scarce. Sound familiar? Rabbits feed on the bark above the snow while mice tunnel under the snow and feed near the ground level. 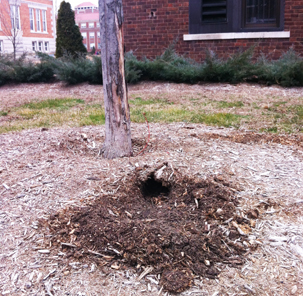 Mouse damage is usually more severe when the trees are surrounded by heavy grass, weed cover or heavy mulch. 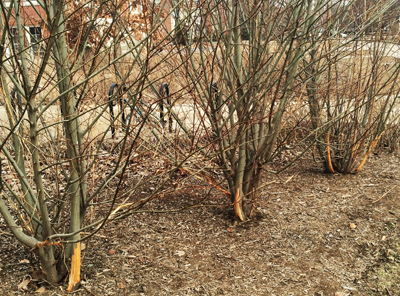 On young trees and multi-stemmed ornamental trees, rabbits remove the bark completely around the trunks and stems, effectively girdling them. All growth above the girdled areas will eventually decline and die, and for most situations, replacing the girdled trees is the best course of action. There are no applications that will mitigate the effects of rabbit damage or save severely damaged trees. Wound dressings, pruning paints, latex paints, wrappings and other alleged protective barriers do not help. Many deciduous shrubs have the ability to produce new shoots or suckers at their base. 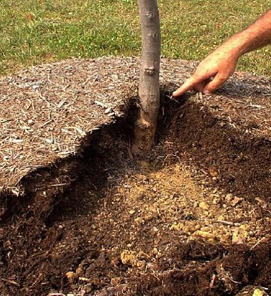 Because of this ability, many severely damaged deciduous shrubs can recover. However, patience is required as several years may be required for some shrubs to fully recover. 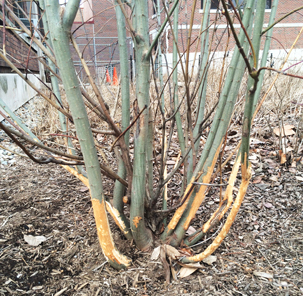 In early spring as the greening begins, prune off girdled stems just below the damaged areas. This will help rejuvenate the plant in most circumstances and replace the damage growth. The most effective deterrent to girdling by mice or rabbits is to wrap the trunk and low branches of young trees with screen wire or hardware cloth. Be certain the wire wrap is buried below the ground line and extends high enough above the possible snow line to prevent rabbits from reaching to the trunk or branches. To help control mouse damage, maintain an area free of grass or weeds for a 1- to 2-foot radius around the base of the tree. Additionally, maintain proper mulch levels, never more than 2-3”, to eliminate the habitat for mice. Various chemicals are available to repel mice and rabbits, but these do not afford the reliability of a well-made barrier.